Head on over to Mets.com for a nice little piece on Doctor K, who is getting married soon, and proclaims himself "good." Buckle in folks, this going to be a long one. Why are we Mets fans? Are we masochists? Seems like the Mets can't go six months without making a move that makes us the laughing stock of baseball. The debut of the patch that will adorn the uniforms of the Mets during home games at City Field is only the latest in a long history of blunders. Seriously, this is what we get? The Junkees introduce their patch, and this is ours? That's what we get for naming our stadium after a failing bank, and then letting the bank for chrissakes design the patch! “It is compatible and consistent with Citigroup’s overall branding and graphic design elements,” Howard said. “That’s the connection. The Citi logo is a fairly simple logo. It’s ‘citi’ in lowercase, with a red arc. So they have more of a minimalist style to their brand and their logo. Obviously, as our partner for Citi Field, we’re going to give substantial deference to their design and graphic treatment.” Howard said the Mets were flattered that Citigroup designed a logo that incorporated the team’s blue and orange colors. Flattered? Flattered!? 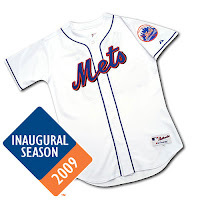 It's a METS uniform that the patch will be sewn onto - don't the Mets get a say?!? 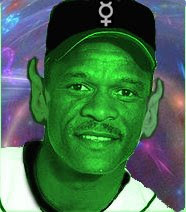 Of course, if we left things up to the Mets designers, the same numnuts who came up with the Mets version of Turn Ahead The Clock Night and decided to embarrass their future Hall Of Famer Rickey Henderson by turning him into some kind of space mutant. Not embarrassing enough for you? How about Shawn Estes missing Roger Clemens with a beanball? The beanball was supposed to be revenge for Clemens clocking Mike Piazza. Speaking of Mike Piazza, how about Piazza holding a press conference on the field to announce he wasn't gay? Or Steve Phillips holding a press conference to apologize for being a creep? This was reminiscent of Cleon Jones being forced to hold a press conference to apologize for a parking lot impropriety. Speaking of parking lots, how about Karim Garcia and Shane Spencer getting into a fight with a local hooligan outside a pizza place in Florida? Speaking of food, how about Dirty/Tardy Sanchez screwing up the 2006 pennant chase by deciding he needed to get in a taxi and go for Dominican Food at 2AM? Speaking of Taxis, how about Tom Glavine busting out his teeth in a taxi accident? Remember Agent Tom Glavine said losing his teeth was "heartbreaking," but spitting the bit in the final game of the 2007 season was "not devastating". The Mets sure seem to finish seasons well, don't they? How about blowing a seven-game lead with 17 to play? And then duplicating the feat a year later? How about allowing Tom The Franchise Seaver to go unprotected in a compensation pool and losing him to the White Sox, where he'd go on to win his 300th game at Yankees Stadium? How about Vince Coleman throwing a cherry bomb at fans in Los Angeles, or Bret Saberhagen spraying bleach from a water gun at reporters? Bobby Bonilla wearing earplugs to drown out the Shea Stadium boos? Kenny Rogers? Roger Cedeno? Allowing Fran Healy to man the TV mike for so long? Folks, the reason why we put up with all this is not because we're mascochists. It's because we're fans. We're loyal to a fault, and we know that victory is twice as sweet when it takes a h ard, rocky road to get there. Being a Mets fans means your not a front runner. Sure, you can go anywhere in the world and see a Yankees cap, but ask that person in that random city to name the Yankees starting rotation and you have a four out of five chance of getting a blank stare in return. But spot a Mets cap in Cleveland, and I'll bet you a Rheingold that the person bleeds orange and blue. Chin Up! We're in it together, Mets fans. And that's why I'll be at CityField this season, and that's why I'm excited that Santanas and Schneiders report in less than 30 days. Lets Go Mets in 2009! Head on over to LoHud for an update on transplanted ex-Mets first baseman Rico Brogna, who's been hired as an assistant football coach at Wesleyan University. MLB.com says the Marlins aren't interested and The Palm Beach Post says Pedro's not going to the Marlins. "Mets, definitely," he said. "Many more memories there than anywhere else." David Cone got his first, his last, and 81 in total, of his 194 career victories with the Mets, and spent close to six years as a Met (his careeer spanned 17 seasons over 18 years). He also had some success with The Junkees, but we'll forgive that for this week. He's a longshot to get in, at least for his first ballot, so we'll save the argument with Yankees fans over which hat he would wear on a more apropos occasion. 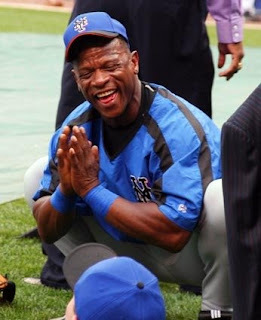 Rickey Henderson is spending Sunday night wondering if Rickey will be the first unanimous election to the Hall Of Fame. Rickey's exit from the Mets in 2000 was so acrimonious that he was the only player who spent any time on the team who didn't get a NL Championship Ring. The Mercury Mets handed out those rings to just about everyone in the organization and every player who had any kind of stint with the 2000 Mets, except Henderson. Steve Phillips explained it as saying Rickey was the only player who also played for another playoff team that season (Seattle Mariners). Rickey was brought back into the Mets fold by Omar Minaya in 2006, and he had a short and somewhat controversial stint as first base coach in 2007. Needless to say I wouldn't even bet you a Cooperstown hot dog that he'll wear a Mets cap into the hall. (But I said it anyway just so I could make a sly reference to a hot dog). Tim Redding Is In; Is Pedro Martinez Out?